Average Height	: 21" - 22"
Photo Courtesy of : Bull Terrier Rescue, Inc. Many untrue statements have been made about The Bull Terrier. It is true that they were originally bred for blood sports, but those were different times. There is a nobility that comes with this Breed, and they are not the nasty dog at all. However this is a breed that is not a good choice as a 1st dog for dog lovers, and not for the weak of heart. The Bull Terrier, a cross between the Bulldog and now extinct White Terrier with some Pointer blood included which developed a powerful and assertive dog. Bred to fight and kill other dogs, owners need to minimize provoking this dog into any kind of fight; a breed that must be kept under control and not allowed to run loose with other dogs. It must be noted that this dog will not go looking for trouble, but will not back down either. This is a dog that was bred not to just fight, but to kill ~ so be very careful if planning to own this breed. In the early 1800s Bulldogs crossed with terriers were popular. By 1830 combat between Bulldogs and bulls were at the height of their popularity. Lovers of this so-called "sport" decided to create a dog that would attack even more agilely. They crossed the Bulldog with the Old English Terrier, adding in some Spanish Pointer blood; the result was the Bull Terrier breed. They soon found that the Bull Terriers were not the most successful fighters. In 1860 the white-coated variety, which was nicknamed the "White Cavalier" was bred by English dog dealer James Hinks and soon became a fashionable pet for nobles. The colored variety of Bull Terriers was created by back-crossing them with brindle Staffordshires. The breed has been used as a guard, ratter, herder and watchdog. The Miniature was developed to have the same qualities as the Standard Bull Terrier but with a more manageable size. The Standard Bull Terrier was first recognized by the AKC in 1885 and the Miniature Bull Terrier in 1991. 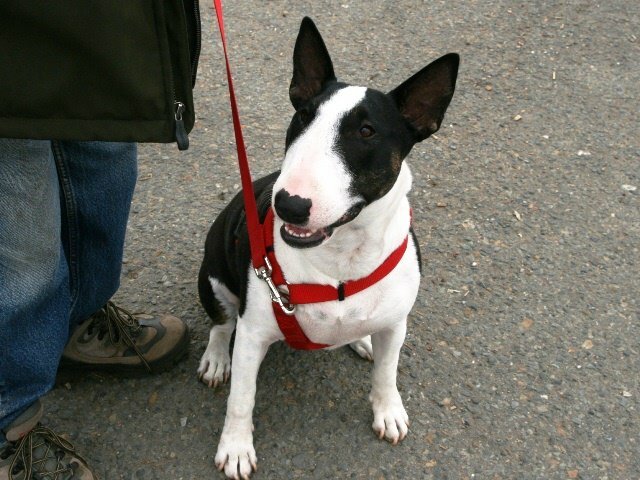 While the AKC sees the Standard Bull Terrier and the Miniature Bull Terrier as separate breeds, the standard requirements are the same except for size. Most other clubs see them as different varieties of the same breed or the same breed without placing a variety label. For example, the FCI (Federation Cynologique Internationale) has both breeds listed under Bull Terrier, separating them by a Standard and Miniature variety. •	Bull Terrier ownership is banned in some cities, states and provinces. Research before seeking out this breed. •	Bull Terriers thrive in the company of their owners and are meant to live indoors, not outdoors, they do not do well in cold climate. •	Can be aggressive towards other pets, small children and strangers. •	Never turn this breed loose in a dog park with other dogs. •	Strong-willed and can be difficult to train. •	Not recommended for first-time dog owners. •	This is a breed that requires moderate exercise. •	This is a breed that does not do well left alone, and can develop separation anxiety easily. •	Bull Terriers make an excellent watchdog. The Bull terrier is a fun loving, people loving and highly attentive type of dog. Their unique face shape often makes them appear very focused and attentive to their owners, and they are known to seem to understand what the owner is thinking and planning to do. As a breed they are often described as clownish despite their rather aggressive start in the dog world. Now the breed is known as a gentle, kind dog rather than the fighting dog it originally was intended as. The Bull terrier requires human attention and interaction to be happy and secure. They absolutely love children and are energetic and sturdy enough to be wonderful companions for kids of all ages. Younger children may need time to get used to the affectionate and somewhat energetic play of the Bull terrier. The Bull terrier, as with many terrier breeds, becomes rather possessive and jealous of both people and objects so needs to be taught to share. Teasing is also a problem with this breed and children and adults must learn not to engage in any type of play the dog may misinterpret as teasing. They are not considered appropriate for a home where they would be alone more than they are in the presence of the family or where they would be kept in a kennel. The Bull terrier is a good watchdog and will bark to notify the family when a stranger approaches, however they are not likely to be highly protective or be an effective guard dog, it is simply not in their nature to be aggressive towards people. With other dogs however the Bull terrier can be very dog aggressive if not socialized at a young age. Male Bull terriers that are intact are the most aggressive and are not recommended for homes with other intact males or even neutered males of dominant types of breeds. Males and females that are spayed and neutered can become good companions for each other, but slow introductions or raising them together from puppies is recommended. The Bull terrier has a high prey drive and is not appropriate for homes with other pets. Sometimes, when raised together from a very young age, the Bull terrier will get along well with cats, however this does require a lot of care and supervision by the owner. Obsessive Compulsive Disorder - prone to activities such as chronic tail chasing, scratching, chewing, anxiety type behaviors. Can be treated somewhat effectively with medications. Deafness - all white Bull terriers are prone to either being born deaf or going deaf very shortly after birth. Grooming the Bull terrier is very simple and this makes it an ideal dog for those that don't have time for elaborate grooming routines. Mnimal Grooming is needed. The Bull terrier is a very athletic dog that enjoys regular, extended exercise as much as possible. They can adapt to less exercise but are also prone to putting on weight, so care must be taken to provide a good balance between food intake and exercise. Without someone to exercise with or something structured to do the Bull terrier will often not self-exercise much and tend to become rather lazy. Taking the Bull terrier on regular walks is a great way to keep both the dog and the owner in shape and provide some outside time together. Since the Bull terrier is dog aggressive it is very important to keep these dogs on a leash as they may fight other dogs or even chase other animals with no regard towards traffic. The Bull terrier makes a great jogging companion or hiking friend. They also love to get out in the yard or park and run and play with the kids, which they will do for hours given the chance. Exercising the Bull terrier is often very easy, as they will simply want to be with the family no matter what is happening. They can get exercise in the home as well by following people around the house provided they are allowed to roam throughout. Without proper exercise or with long or even relatively short periods of confinement or inactivity the Bull terrier will start to develop very problematic habits. They are known to chew and destroy objects in the home as well as become problem barkers, tail chasers and even resort to messing in the house to display their displeasure with being alone. Before leaving the Bull terrier in the house or yard it is important to provide some type of structured exercise to help the dog cope with being alone. Training the Bull terrier is critical to ensuring that the dog is well behaved and well mannered both in and outside of the home. They do need regular interaction and socialization with other dogs and people to minimize the risk that they will become highly dog aggressive and overly possessive of their home and family. As a dominant breed of dog they need firm and consistent yet positive and loving training, especially as puppies. Establishing that the humans are in control with these dogs is critical, as they will quickly develop bad habits if they think that they are in control. The Bull terrier is a very intelligent dog and will learn who he or she needs to listen to and which family members they can ignore or respond in a limited way too. One person should initially work with the puppy until the commands are understood, then the others in the family should also work with the dog. The Bull terrier often will simply ignore the commands of those it seems as "below" it on the family hierarchy, so everyone must work with the dog. As an energetic and active dog, especially as a puppy, the Bull terrier should never be engaged in games that pit strength of people against the strength of the dog. Wrestling or tug-of-war type games are likely to increase dominance type behaviors as well as possessiveness and territoriality. In addition they are often prone to jumping up with their front feet on people, something which is often frightening to kids and adults alike, so teaching them to sit for attention is important. Lead or leash training is essential for the breed at an early age. A Bull terrier should always be controlled when outside of the yard, particularly intact males. Early leash training through an obedience program is important as with proper socialization these dogs can be taught to be off the leash. Many people choose to use their Bull terriers in obedience and agility type events. This breed can excel at these competitions and are eager and willing to perform in front of crowds or groups. Their natural fearlessness and good humor is evident in their attitude towards the competition.